Hospitals and health systems using IT from CommonWell member companies will be able to bilaterally exchange patient data within their EHR workflows. CommonWell Health Alliance has made Carequality Framework connectivity generally available to its members, which will "break down yet another barrier to interoperability," said CommonWell executive director Jitin Asnaani. 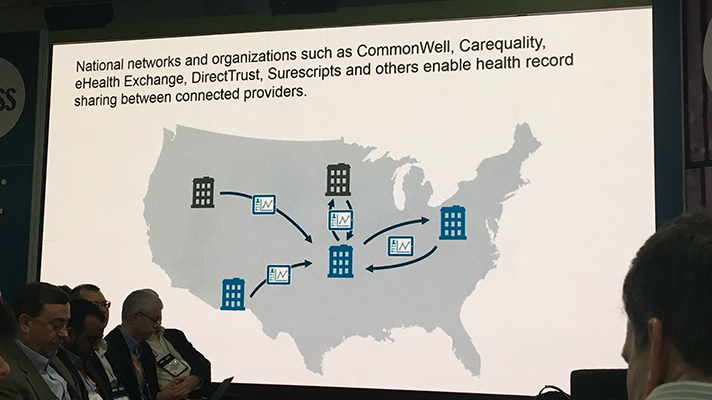 Providers who participate in CommonWell and Carequality will be able to connect to each other and bilaterally exchange health data for better care coordination and clinical decision-making officials said. CommonWell service provider Change Healthcare built the infrastructure, and Cerner and Greenway Health used it to roll out connectivity pilot this July with some of their clients, who in turn have been exchanging data with other Carequality-enabled providers. Since the summer, more than 200,000 documents with Carequality-enabled providers have been exchanged bilaterally nationwide. Now other CommonWell members are building off that successful connection, such as Brightree, Evident and MEDITECH, are in the process of subscribing to the connection and taking it live with their provider clients. The two groups, who have been working together since 2016, said this news is a milestone on the long road toward more seamless interoperability – advancing the mission of making health data available to individuals and providers regardless where care occurs. In July, Massachusetts eHealth Collaborative CEO Micky Tripathi, who is on the board of both CommonWell and The Sequoia Project (which oversees Carequality), said the go-live of a nationwide health information exchange, encompassing all the big EHR vendors, enabling about 80 percent of doctors to share patient data, "will be a signature moment in nationwide interoperability." Tripathi said he's "very sanguine about where interoperability is and where it's headed. You can decide whether that means I'm biased or bullish, but I think it's more the latter." In press statements, CommonWell and Carequality offered perspective from several of their leading provider members. For instance, Michael Donnenwerth, a podiatrist at Minnosota-based Winona Health, a Cerner client, said the connection enables to clinic to directly access patient records from various tertiary care centers in the region. "We are now able to integrate new medications and problems into our EHR seamlessly, which provides the most accurate and up-to-date information possible," said Donnenwerth. "This flow of information has not only connected our medical records, but it has allowed us to truly provide better care as the ambiguity of outside doctor visits has been virtually eliminated." "Now that we’re able to get patient information across disparate providers through the CommonWell-Carequality Connection, I think it will reduce hospital readmissions," added Roneisha Ward, director of health IT at Carolina Family Health Centers, a Greenway Health client. "By knowing what was done on the other end, we aren’t duplicating work in labs and referrals and patients don’t have to spend lots of time and money outside of the clinic," she added. "It’s a win-win for the patient, the organization and the hospitals."